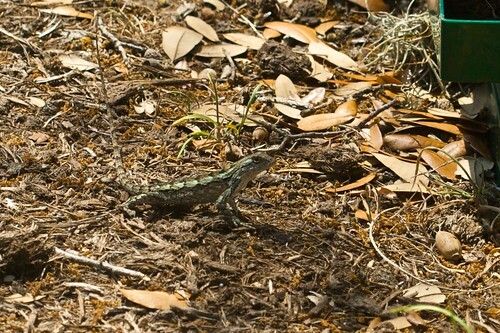 For the past year, we have been trying to get a picture of this super fast lizard who hangs out around the bee yard. I can only assume he takes advantage of dead bees that are thrown out of the hive for an easy meal. With yesterday’s carnage at Ramona’s hive, this guy was having a field day. Of course, I don’t know how he will react to eating tons of pesticide ridden bees, but hopefully he will be ok.
That’s a Texas Spiney Lizards, and they are very fast. I had one that was about a foot long around my house for a while.